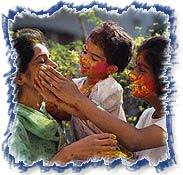 Colour, contribution, enthusiasm, prayers and rituals are the characteristics of the Festivals of India. The travellers are attracted to the scale and elaboration of the merrymaking that populate the cultural scene of the country. The various festivals in the country can be categorised on the national, regional, local, religious, seasonal and social grounds. This is a ten-day festival, jubilated during the bright half of Bhadrapad (August - September), celebrates the birth of Ganesha. It is featured with a grand procession of the elephant-headed god. 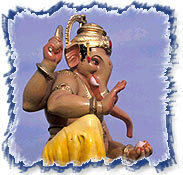 Ganesha Chatturthi is celebrated with immense fun and entertainment in the state of Maharashtra. This is one of the oldest and the most important Hindu festivals falling in the month of Kartik (October-November), which celebrates the return of Rama to Ayodhya after an exile of 14 years. Diwali or Deepawali also marks the beginning of the New Year and is celebrated with the lighting of lamps, burning of crackers. The festival of Deepawali is celebrated in almost all the parts of India. Celebrated mostly in North India, celebrates the birth of the monkey god, Hanuman, during Chaitra (March-April). The festival also highlights the figurative acceptance of the human race's peaceful co-existence with nature and the worship of an animal. Krishna Janmashtami falls during the dark fortnight in the month of Bhadra (August-September) and is celebrated to commemorate the birth of Krishna to bring an end to the injustice of Kansa. The festival is marked by fasts, prayers and the enactment of incidents from Krishna's childhood. Jubilated on the new moon night in the month of Phalguna (February-March), this Hindu festival is committed to Lord Shiva. This Hindu festival goes on for nine days where it is celebrated in the bright fortnight in the month of Chaitra (March-April) and commemorates the birth of Lord Rama who took birth to annihilate the demon King Ravana. Makara Sankranti celebrates the Entry of the sun into the Tropic of Capricorn in the month of Magha (January-February). Celebrated in the month of Ashvina (September-October) in the state of West Bengal, Durga Puja is a nine-day festival (of which five days from Sashthi to Dashami are the most celebrate one in West Bengal) of the Hindus. It highlights the winning of Goddess Durga over the buffalo demon Mahishasura after a long battle, bringing forth the victory of good over evil. The most important and the most rejoiced festival of Christians is Christmas celebrated on the 25th of December. The festival marks the birth of lord Jesus and is celebrated with great enthusiasm all over the country.